Newsletter2Go offers advanced reporting tools that helps you improve your email marketing. After the newsletter has been sent, you will immediately get a detailed real-time report. It contains the open, click rate, CTR and many other data pieces that are clearly broken down for you. Upon request, individual IPs can be excluded from newsletter tracking. You can see at a glance how many recipients have opened your email campaign and what how many of them clicked on one of your links. The newsletter open and click rate are one of the basic key figures in email marketing. Newsletter2Go reports break these figures down so that you can easily understand which are your strong areas and where you need to focus your efforts. You can choose to see the report in browser or download it as a PDF. Every newsletter report shows you every important figure you’d like to see: the open, click-through and bounce rate. The newsletter tool always shows you the unique open rate and open rate separately. Therefore, you can see how many recipients has opened your email campaign. Our real time newsletter tracking options are user-friendly to ensure your email marketing success. 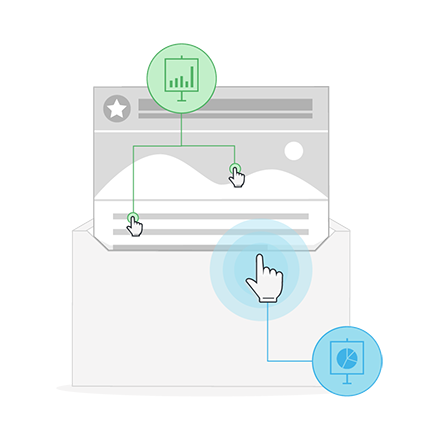 In order to track the newsletter open rate, an invisible graphic is installed within the newsletter. As soon as your newsletter is opened, you will be able who has viewed the newsletter and where was it opened thanks to the piece of graphic. In order for us to track the click rate, newsletter readers are redirected to website with a tracking link for a fraction of a second before they reach the linked page they intended to open. This tracking link is usually a Newsletter2Go domain. However, if you want to use your own tracking domain to evaluate the newsletter key figures, you are free to do so. If you’d like to, you can also view a list of all subscribers who have opened the newsletter. That’s a highly useful feature that enables you to segment your recipients in order to improve your future campaigns. It will allow you to address email openers and non-readers differently and get more opens. Send specific follow-up mails to re-engage lapsed users. If you would like to track newsletter opens and clicks and know whether your newsletter campaigns get good results, you can use our annual email campaign stats. This blog post showcases average newsletter open rates as well as click rates across different industries. If you have a good point of reference, you can get a better grasp of your own marketing pursuits. Thanks to it you will know what CTRs should your company expect and you can track email campaigns with confidence. To keep track of the newsletter/website open and click rates or in your online shop, you can integrate the software with Google Analytics and econda, which will help you increase newsletter click rates even further.